At Medallion, we are constantly updating and improving our manufacturing process. 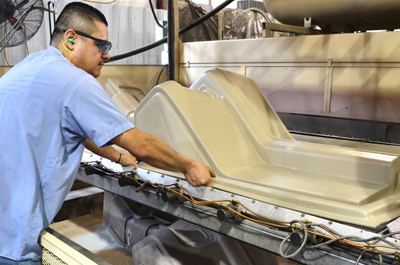 We are currently utilizing 18 thermoforming production lines which are supported by numerous robotic and CNC trim stations. 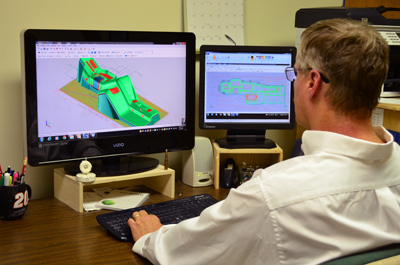 We can produce custom parts ranging from a few square inches to well over 100 square feet. The majority of our equipment is computer controlled to help assure our products are consistent in quality. Much of our equipment has also undergone custom engineering, enabling us to manufacture products at a level of complexity and quality not attainable by our competitors. 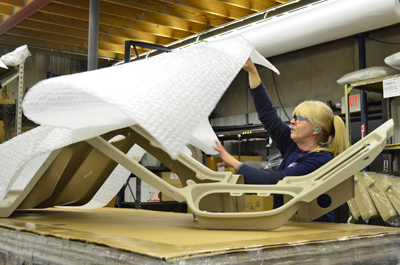 Medallion has developed a reputation in the thermoforming industry for doing what the experts say cannot be done. All projects start with a customer-centric meeting to discuss what exactly is needed to fulfill the customer's expectations and product requirements. This includes part design considerations, raw material options, quality and tolerance requirments, project timeline and any special packaging requirments. The Medallion team addresses any customer questions and establishes a project timeline that matches our customer's needs. 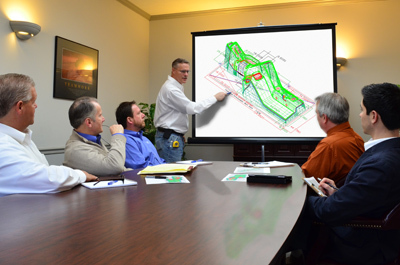 We meet with customers to discuss key objectives. Medallion can provide design and engineering support that is unequaled in the industry. In many cases this support begins with a customer concept or software based design which is then developed into a CAD model. Once the CAD file has been finalized the second phase of building production tooling begins. The CAD file is processed into a surface file which becomes the computerized work instructions for a 5-axis CNC router. This CNC router then mills a pattern from polyurethane tooling board. Because of the precision-controlled nature of the CNC equipment, patterns are milled with a very high level of accuracy. Patterns are cut on a 5-axis CNC router. After the pattern is approved, the third phase of production tool creation begins. The pattern is prepped to eliminate surface imperfections and coated with a release agent. Layers of proprietary resin and fiberglass are applied to the pattern to create a "skin" or negative. Once this application cures, stiffening reinforcments are added to it and it is removed from the pattern. Layering up a ceramic mold. With the mold completed we are now ready to move into the production phase of the product creation process. 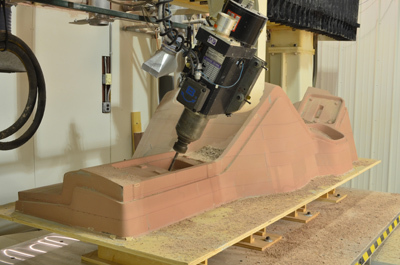 The new mold is secured onto a machine platen and then connected to a vacuum draw system. A specifically sized flat plastic sheet is clamped into a movable frame which is located either below or above the mold. Formed part removed from a mold. 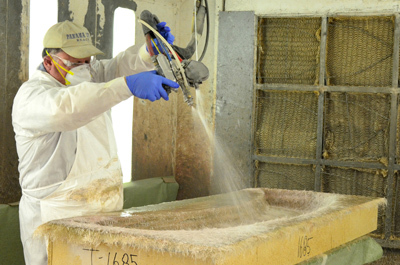 In almost all cases, the formed part will be trimmed from the original sheet to allow for further processing. 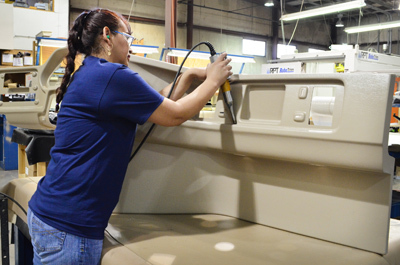 Some secondary trim operations can be accomplished by hand using fixtures and templates. However, many products manufactured by Medallion require precise cutouts for switches, gauges, ventilation slots and component assemblies. 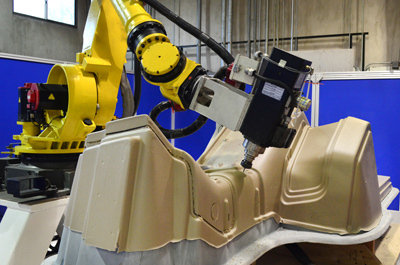 Robotic trimming ensures part-to-part consistency. Part assembly process using sonic welder. Medallion's superb reputation for developing strong customer partnerships is based on our customer-centric product development, sophisticated production and quality abilities and our ongoing customer support. We know that excelling at product creation, production, and quality would mean very little if we did not ship the product on time. Protecting finished part assembly for shipment.